Over the years I have written for publications in pretty much every continent except Antarctica; but given the transitory nature of printed matter, most of it no longer even sits at the bottom of birdcages. So, I have created this online home for some of my stuff, pour yourself a glass of wine, sit back & have a read. Luxury brands and the watch industry. Whilst at Basel I did a 'thought piece' for CNN on the way that luxury brands are currently pouring vast amounts of money into their watch divisions and how these brands are becoming the innovators. If you have five minutes, have a look. Rolex are known as a firm where change is at best gradual, and at worst, glacial; pretty much all of the introductions at Baselworld this year were essentially 'variations on a theme' but quietly (almost surreptitiously) Rolex made two radical introductions this year. The first was the SYLOXI silicon hairspring in the new ladies 2236 calibre, which I expect to see fitted to more calibres over the years. But, perhaps, the most radical introduction this year was that of the first automatic Cellini range. 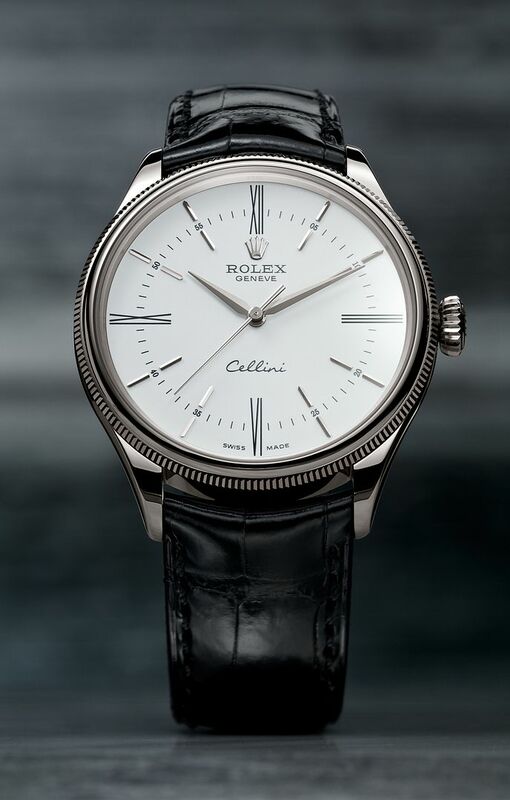 Essentially, the Cellini range has been the answer to the question that nobody ever asked; I mean, did anyone ever sit awake in bed at night thinking "I REALLY want a Rolex, but I want one that isn't waterproof and isn't automatic"; so the range sat there, unloved and unsold, a victim of Rolex's own powerful publicity machine. Just think about it, for almost ninety years, Rolex have been telling us that a Rolex is waterproof and for eighty years they have been telling us that it is also self winding and that the best of Rolex was a watch which combined both. So, what chance did the Cellini range really have? 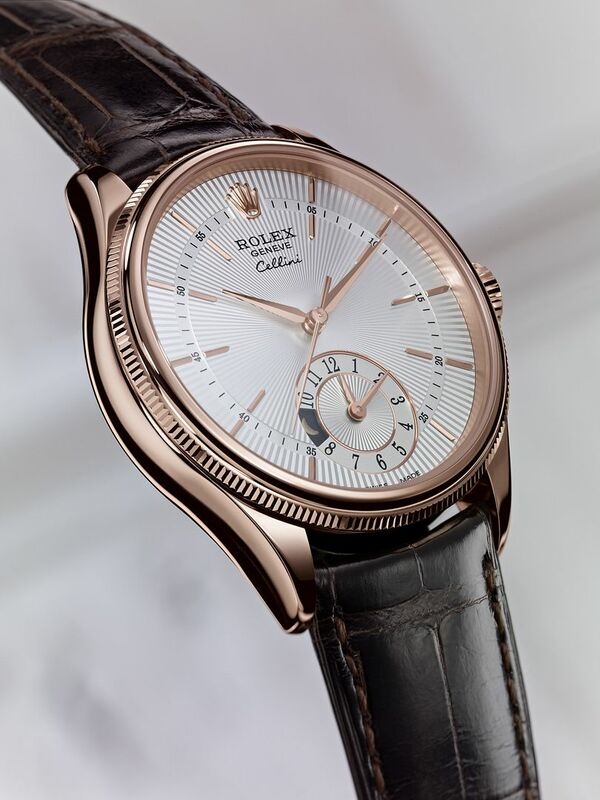 So, in the most radical move imaginable, Rolex have introduced a new Cellini range which has not only a self winding movement, but also a screw back and screw down crown. It is available in a classically styled 39mm case with a most unusual bezel which has both polished and milled finishes in concentric circles (interestingly, this bezel is made in one piece, so I have no idea how they make it). As well as the classic three hand watch shown above, there are two variants, a date version, where the date is indicated via a subsidiary dial at 3, rather than the conventional window. The most unexpected version (that is after the entire range itself) is a GMT version, although it is called the Dual Time, rather than GMT, which indicates a second time zone via a subsidiary dial at 6. The movements for all of them are based on the Rolex 3135 but with the added modules for the subsidiary functions of the second two models; the movements are all fitted with Parachrome Blue hairsprings and are COSC rated, although there is no confirming text on their dials. The dials themselves are perfect for a dress watch, with elongated Roman numerals for the quarter hours on the Cellini Time model, an inner second/minutes track and beautifully polished 'leaf' hands. The Cellini Date model has simple elongated batons and a sunburst guilloche finish whilst the Cellini Dual Time model has a similar dial to the Date but with the addition of a 12 hour second time zone at 6, inset into this sub dial is a day night indicator at 9. All the dials sit under a domed sapphire glass, and I have not yet been able to discover if it is anti reflection treated. 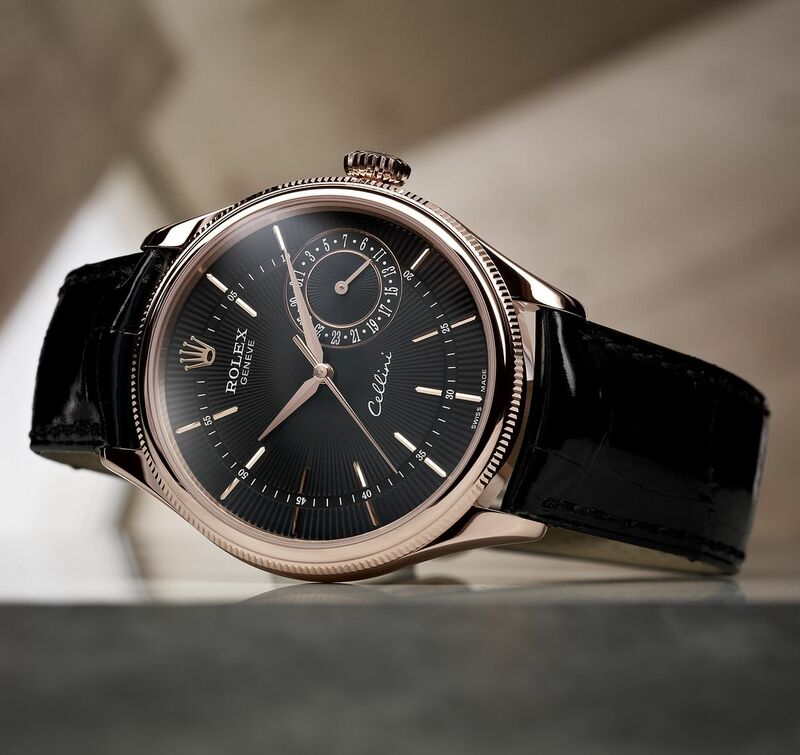 Each model is available exclusively in 18ct gold, either Everose or Rolex's own formulation of White Gold and with either a silver or black dial; meaning that there are twelve variations in the range. As I said in my opening, Rolex are not renowned for radical change, but in this case I applaud them for this very radical change; as the resulting watches are pretty much guaranteed to outsell the previous Cellini models by a sizeable margin.